Bursitis – what is it and how is it treated? We have bursas (or bursae) all over our body, in fact we have over 150! 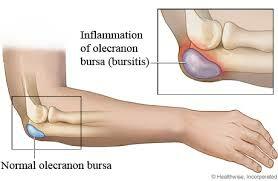 A bursa is a fluid filled sac, usually found around joints, between bones and tendons, muscles and/or skin. Bursae cushion and glide to allow for movement and also prevent friction. 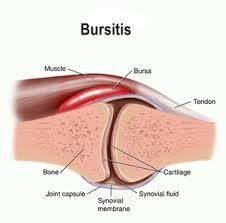 When bursae get irritated and inflamed, this is called bursitis. Bursitis can sometimes be the result of a discrete direct trauma, such as falling hard on your knee or elbow. 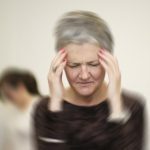 It can also be caused by a lower grade irritation over a longer period of time, for example poor muscle control around the hips and pelvis when walking. 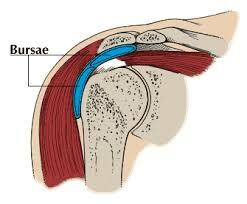 Therefore we have to consider some types of bursitis as a symptom of another issue. For example, poor muscle control or weakness, muscle imbalance, altered biomechanics or sub-optimal positioning of our joints. Bursitis can sometimes be quite visible. Bursitis around the elbow (olecranon bursitis) and bursitis at the knee (prepatellar bursitis) can appear large and swollen. Other times the bursitis may not be visible, as with shoulder (sub- acromial) bursitis or hip (greater trochanteric) bursitis. Pain is the main symptom you will notice with bursitis, usually with or after movement and/or pressure on the affected area. Bursitis can be assessed and treated by your Physiotherapist. Diagnosis can usually be made without scans, but bursitis will appear on ultrasound, CT or MRI (depending on the area of the body). Assessment will include a biomechanical examination to determine underlying causes of the bursitis. Treatment will vary depending on type, severity and your individual case. It can include rest, ice, exercise prescription, activity modification and taping. In some cases the use of corticosteroid injection may be indicated. Your Physiotherapist may also refer you to Sports Medicine if this is warranted.